Used camper parts can be a great option and definitely something worth considering if you choose to build your own camper van. All you have to do is get a used van, source out used parts through various resources, modify or fix them as needed and fit them in. Sourcing out used parts is a lot of tedious work, but it all kind of depends on what you need and how lucky you get searching for your desired products. However, being patient and taking your time to do the research pays off on the long run. The whole project will be a rewarding process for you and the final price of your van will be much lower at the end. New camper conversions are heavenly expensive and we're not all made of money, but that's just not a good enough reason for you to back out on your camper project. You can use all kinds of used parts from older recreational vehicles such as motorhomes, camper vans or trailers. Just check out your local eBay, other related sites or even your local scrap yard. Anything that's much cheaper then new and still usable is always better then new and expensive. Here's a short story of my friend's Volkswagen project. He loves to travel and he's addicted to these campers. And money is something he doesn't have a lot of. So he bought a cheap, low mileage 1985 Volkswagen passenger van to start of his adventure. The van itself was in a pretty good shape but there was a lot of rust to deal with. He is a very resourceful type of person and the last thing he does, is jump into premature conclusions. It took him well over a year to finish his homemade project, but it does look awesome! Apart from a few minor accessories this van was build entirely by using used camper parts and other used bits and pieces he picked around. The first thing to do when the van got home was paying a visit to the local repair shop. The van had an underpowered 1.600ccm diesel engine and a four speed transmission. A new Volkswagen 1.900ccm turbo-diesel engine and a matching 5-speed transmission found a new home. 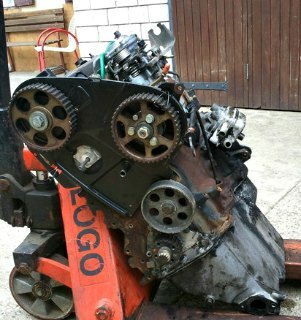 The engine came from a VW Passat and the transmission from a similar donor van. The mechanics were thoroughly checked, and the engine was partialy rebuild using new or rebuild parts. 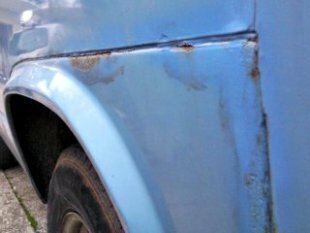 The rusty spots were sanded down and treated with a grinder or simply cut out where rust damage was impossible to fix and replaced by a fresh sheet of metal and properly treated with anti-rust primer coating. 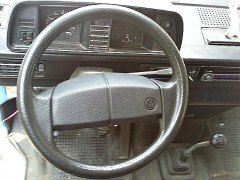 A new steering wheel and a couple of new front row seats are from another, more modern day Volkswagen van found on the local internet sites. They were just taking up space at somebody's garage. The price...a smashing free of charge! There is of course a bit of work required to make them fit properly on the original seat base. 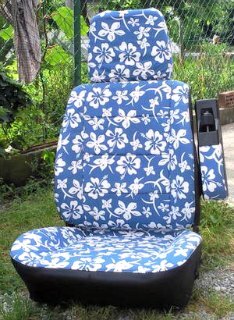 The seats where simply cleaned out and brand new Hawaiian Ho'okipa seat covers were added for a fresh look. But the most important used camper parts where found on German eBay. Why German? Because it's the closest option to buying something if you come from Slovenia like we do. 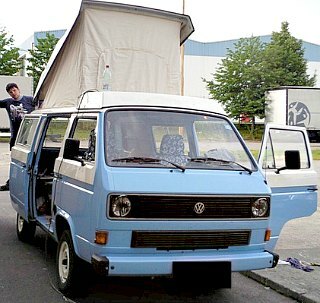 And the Germans do have a highly developed camper van culture and are recognized as European top travelers. 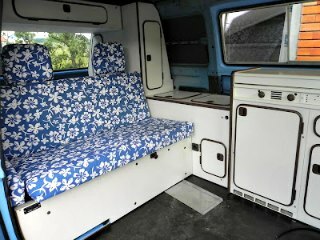 So, a complete set of original Westfalia camper furniture including, cabinets, cupboards, double burner stove, a working refrigerator and the folding rear bench at an amazingly low price, all found in Germany. Now ain't that just great? The furniture was thoroughly cleaned and repainted and the rear perfectly functional bench has a new Ho'okipa upholstery matching the front row seats of course. 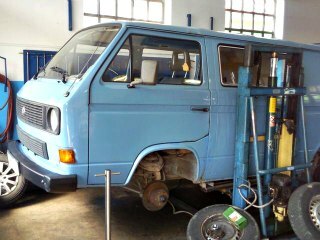 The other great used part found in Germany was an old Westfalia pop top roof. The canvas was changed by a local tent repair shop and the roof repainted in white color. Both of these items required a long trip to Germany, but at a price of a couple of hundred Euros it was more then worth the trouble! 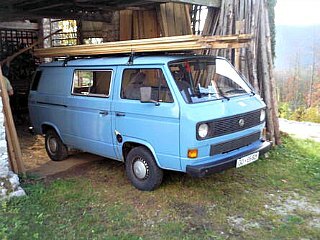 At this stage the van was striped to bare metal, with all the original lining, upholstery and some other parts sold on our local Volkswagen camper forum or thrown away. A fresh new double tone white and light blue paint job was added for a brand new look. After the painting was done, the grill and the windows got new chrome trim all around. At the same time, the 25-year old wheels were thoroughly sanded down and painted white. The brand new chrome hub caps along with the chrome trim and new aftermarket headlights come from companies like JustKampers or GoWesty, the UK or USA on-line VW candy stores. 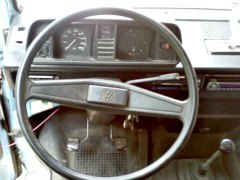 Before fitting in the original Westfalia used camper parts, new lining and upholstery including all the power cables and gas hoses were fitted in the van using similar procedure described on the build your own camper web page. 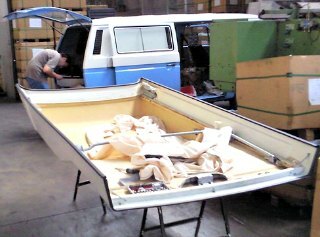 Of course the pop-top roof and the canvas were installed on the roof of the van just before the above procedure took place. As I said before, the whole project took about an year to get finished. Sourcing out used camper parts does takes a lot more time then it will take you to read this web-page. Not to mention all the other work that had to be done. It may look quite easy on pictures but the reality is far more bitter. Used Camper Parts And "Voila" ! But it was all worth the trouble at the end. 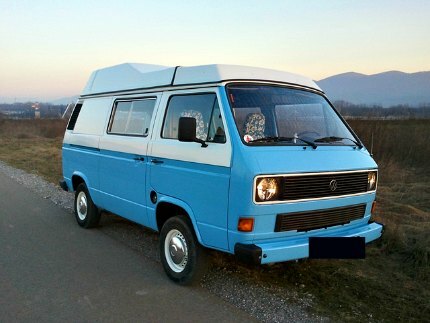 This restyled Volkswagen camper looks awesome. And it's called the... Flawa Pawa Van! Believe it or not, this ex-working van has been all around Europe with only a few minor problems. From Portugal, Scotland and all the way up to Nordkapp in Norway. If you don't mind using your preferred on-line translator tool you can read about all the adventures on the Flawa Pawa blog. Have fun translating and building your camper van using used camper parts!